Coming up with creative drinks for yourself or for friends to try isn't difficult with the triumverate of vodka, peach schnapps and lemonade. While vodka and schnapps of all types are present in any number of beverages and vodka drinks, the citrus sweetness of lemonade, whether in a quick splash or as the main event, adds something different to your drink. It can impart a tropical flavor in certain combinations while retaining a taste "just like home" in other instances. Moreover, these three ingredients mix well together in a variety of combinations, and they can be added to other flavors in a shot or a cocktail. Don't waste your time experimenting to come up with just the right combination. Here is a list of drinks, tested and proven, that will combine vodka, peach schnapps and lemonade in perfect proportions and often with other ingredients. Whether you prefer a quick shot or a delicious cool cocktail, these drinks will satisfy your need. When the comet Hale-Bopp passed from 1995 to 1997, it was the longest and most widely viewed celestial event in recorded history. The Hale Bopper, which borrows the comet's name, is an out of this world drink for any occasion. Simply combine one ounce of citrus vodka, one ounce of peach schnapps and one ounce of lemonade. Shake them with ice, and then strain them into a glass and serve. You can serve this as a cool cocktail with a cherry for a prolonged, flavorful experience, or you may decide to shoot it for a powerful but very tasty quick drink. You don't have to be a Southerner to enjoy the Georgia Peach, a fantastic cocktail with a bit of kick to it. Simply fill a Collins glass with ice, and layer it with 1 ½ parts vodka and ½ part peach schnapps. Next, add as much or as little lemonade as you prefer. You may choose to fill the glass for a less potent, delicious cocktail, and finish up with a quick splash of grenadine over top. The drink looks like a peach and tastes like a peach with a bit of citrus flavor to boot. The grenadine makes the drink look especially attractive when served over ice, so don't skip this step! The Atlanta Brave is a delectable and simple drink, but it becomes even more flavorful with just a dash of lemonade. Begin making a regular Atlanta Brave by adding one ounce of unflavored vodka to an ounce of peach schnapps, and then shake the ingredients with ice. Strain these ingredients into a low cocktail glass with a few rocks in it, and fill to the top with lemonade. 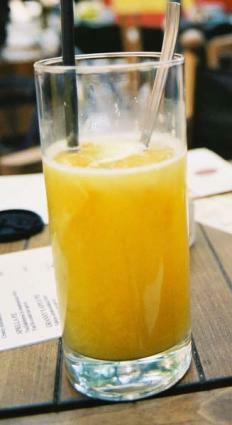 While the ingredients aren't much different from other drinks containing vodka, peach schnapps and lemonade, the result of the Power Juice cocktail certainly is. The introduction of raspberry liqueur into this great cocktail imparts a tart, berry flavor without losing the characteristic citrus of the lemonade. Over ice, pour equal parts of lemonade, raspberry liqueur, peach schnapps and citrus vodka. Stir and serve as is, or you can choose to shake and strain. The combination of ingredients such as Midori and Triple Sec gives this cocktail a very different taste from similar beverages. Midori, the green colored, melon-flavored Mexican liqueur, is one ingredient that is essential to the beverage. Begin with a chilled Collins glass and add five ounces of lemonade. If you prefer, you can let this ingredient sit in the freezer for a bit to get a little "slushy". Next, add one ounce of vodka and one half ounce each of Midori, peach schnapps and triple sec. Layer the ingredients or shake them together. Finish off with a dash of grenadine and allow the grenadine to sink; This will make the drink appear similar to a piece of watermelon.